Bolting greens have essentially decided – in response to heat, lengthening days, and any other stresses – that it’s time to make make seed, and to make as much seed as they can, using all the energy stored in their roots. Though we can’t convince them to go back to making large, tender leaves again, we can reap other benefits from them, and we can extend our harvest windows with methods like succession planting. Once this spinach had started to bolt, weeding it was no longer a priority for us. Luckily we had a later planting of spinach just coming on. 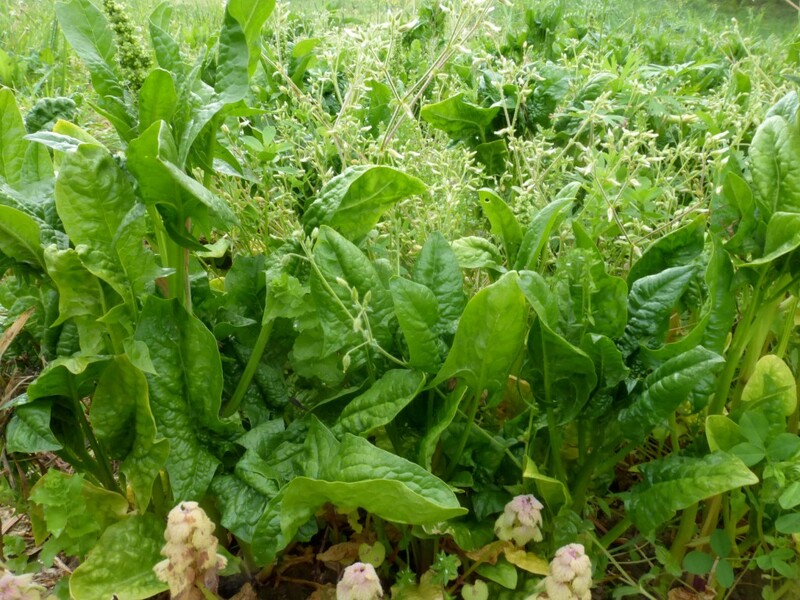 The younger spinach hasn’t been through as much cold, and so it will tolerate more heat than this planting before it bolts. We also spread out the harvest from this patch by harvesting taller plants first, thus giving the shorter plants more room to grow outward. In the process of bolting, lettuce becomes extremely extremely bitter. By harvesting early in the morning – not many hours after sunrise – I find I can often still get good-tasting greens off of bolting lettuce, but the lettuce in this picture is simply too mature to harvest. The lettuce plants to the left are farther along in the bolting process than the plants to the right, probably because they’ve gotten more sun. The cilantro in the background has also bolted, but its leaves still taste about the same as they did when the plants were younger. The cilantro flowers and immature seeds are also edible, and mature cilantro seeds are coriander. 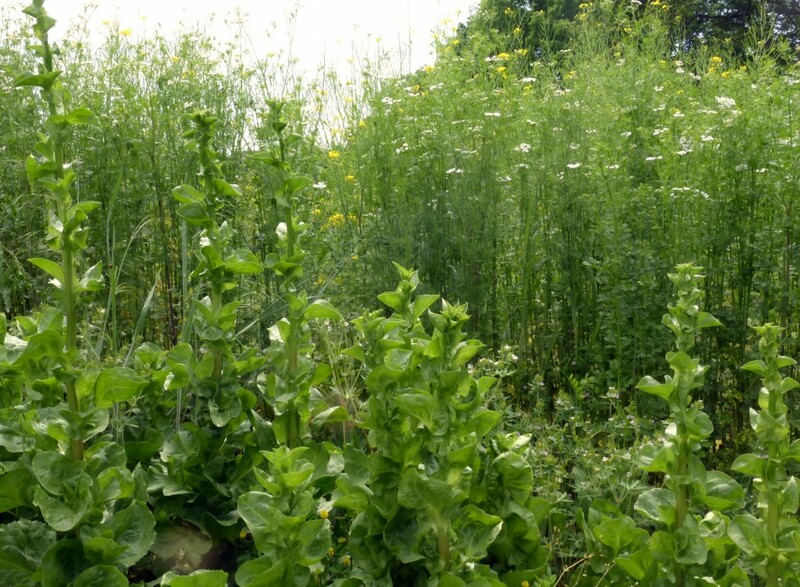 Our farm’s fall and winter vegetable garden from late 2014 now looks like a meadow. 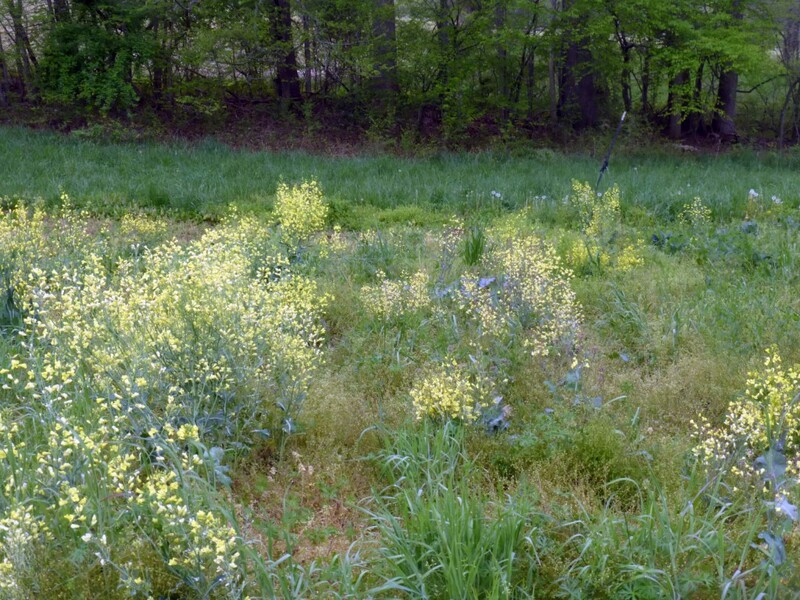 The bluish leaves and yellow flowers are kale. These flowers feed bees, other pollinators, and sometimes people. We’ve also been letting our cow graze at the edge of this garden-turned-meadow. The mature, flowering stems of plants in the brassica family, including kale, collards, mustard, arugula, and cabbage, tend to be tough, and the leaves have a strong flavor that you might not like, though it’s not nearly as bitter as bolting lettuce. But the the flowers themselves can make great additions to salads and great snacks in the garden. 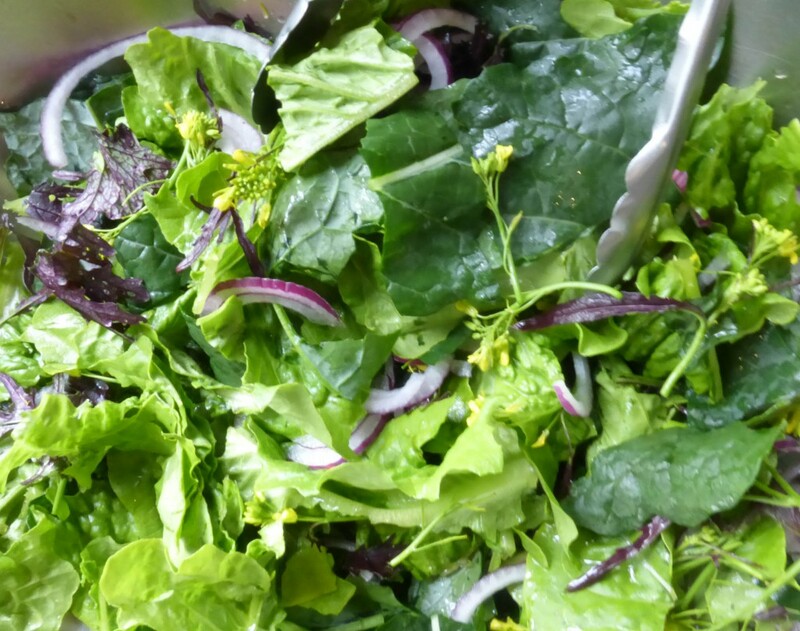 I especially like arugula flowers in salads, but for this salad we used mustard flowers.